The EURUSD had a strong bullish momentum on Friday, topped at 1.4246 but fell sharply earlier today in Asian session slipped below 1.4000. As you can see on my hourly chart below price is testing the trend line support. The bias is bearish in nearest term but as long as price stays above the trend line support my overall bullish intraday outlook should remain intact. A clear break and daily close below the trend line support and 1.3950 would be a threat to the bullish outlook testing 1.3850/00 support area. Immediate resistance is seen around 1.4100. We need a clear break above that area to keep the bullish scenario remains strong. The EURJPY had a huge bullish momentum earlier today in Asian session, broke above the major trend line resistance (white) and hit 111.58 after a broad Yen weakness triggered by intervention by the Japanese government. Technically this fact signals a major bullish reversal scenario testing 111.92 even 113.00 and 114.00 area. Immediate support is seen around 109.90 followed by 118.00. The GBPJPY had a huge bullish momentum earlier today in Asian session, broke above 122.62 and hit 127.28 after an intervention by the Japanese government. Technically this fact gives further confirmation to the double bottom bullish reversal scenario testing 128.00 – 130.82. Immediate support is seen around 125.50 followed by 122.62. The AUDUSD failed to continue its bullish momentum earlier today in Asian session, slipped back below 1.0530. The bias is neutral in nearest term. My overall intraday outlook should remain bullish and only a clear break and daily close below 1.0400 could stop the bullish outlook, even turn my intraday outlook to a bearish view. Immediate resistance is seen around 1.0600/20. A clear break and daily close back above that area would keep the bullish scenario remains strong, still testing 1.0800 area. The GBPUSD failed to continue its bullish momentum earlier today in Asian session and now testing the lower line of the bullish channel as you can see on my h4 chart below. As long as price stays inside the bullish channel my overall bullish outlook should remain intact but this fact is a serious threat to the bullish outlook as a clear break/daily close below the bullish channel and 1.5950 support area could turn the short term technical bias to a bearish view testing 1.5850 support area. Immediate resistance is seen around 1.6035. A clear break above that area could lead price to neutral zone in nearest term but would keep the bullish outlook remains strong, testing 1.6100 – 1.6150 resistance area. The USDJPY had a significant bullish momentum earlier today in Asian session after an intervention by the Japanese government to weaken the Yen, broke above 77.80 and hit 79.50. Technically this fact signals a bullish reversal scenario, testing 80.23, 81.46, 82.22 even 85.51. Previous interventions this year were failed, and another movement and daily close back below 77.80 would be another failure for the Japanese government. The USDCHF was corrected higher earlier today in Asian session after failed to make a break below 0.8550 support area last week. The bias is neutral in nearest term. My overall intraday bias remains to the downside and only a clear break and daily close back above 0.8810 could stop the intraday bearish outlook. Immediate support is seen around 0.8660. A clear break and daily close back below that area would keep the bearish intraday bias remains strong, retesting 0.8550 strong support area. In the previous EUR/USD review we noted a bullish correction since the test of 1.32. The bullish momentum is strong as it managed to break the resistances of the SMA 20 / 1.36 / 1.38 within a week. From a fundamental analysis point of view the Euro was soaring due to renewed optimism that the budget deficit crisis of the euro zone would be over soon. Vows to ensure stability and the capitalization of euro zone banks were taken favorably by the markets. Having said so, one must continue to remain vigilant towards the possibility of any adverse developments. After all the debt situation in the US is not getting any better for now. 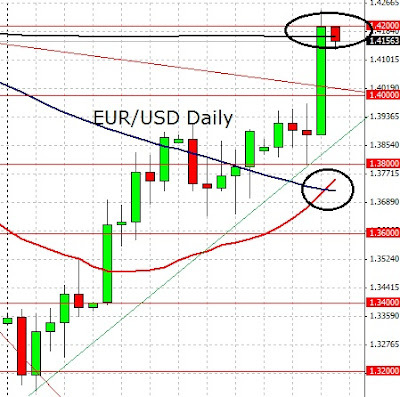 Looking at the EUR/USD chart above, we noted that the bullish momentum continued and had since gained a fair bit. The SMA 20 has crossed the SMA 50 and we should be looking out for the SMA 50 to turn bullish too for the possibility of a sustained bullish momentum. The EUR/USD is now facing 2 strong technical resistances. The 1.42 region and the SMA 200. The 2 cents gain by the currency pair during the later part of the week is believed by many to be too fast and there may be a technical bearish correction. Continue on to TheGeekKnows.com for the fundamental analysis of the EUR/USD Weekly Review to understand more about the underlying market sentiments. The GBPUSD continued its bullish momentum this week, as a part of the bullish phase since made a false breakdown below strong support 1.5330 earlier this month. From a weekly chart outlook as you can see on my weekly chart below, price has been moving inside a triangle formation suggests a consolidation phase. My intraday bias remains strongly to the upside, testing EMA 200 and the upper line of the triangle, a strong resistance area which located around 1.6450 and 1.6635. On the downside, last week’s high at 1.5972 could be an important support at this phase. A clear break and daily close back below that area could stop the current strong bullish intraday outlook. The EURUSD had a significant bullish momentum yesterday, strongly broke above key /major resistance 1.4000 and hit 1.4246 after bounced strongly to the upside from the trend line support on Wednesday as you can see on my hourly chart below. This fact could trigger further bullish scenario not only in nearest term testing 1.4280 – 1.4300 but also could lead to a bullish attempt testing 1.4530/48 area (August high). Immediate support is seen around 1.4150. A clear break below that area could trigger further bearish correction but any downside pullback now is normal. As long as price stays above 1.4065/00 I still prefer a bullish scenario at this phase and only a violation to the trend line support can stop this strong bullish outlook.